I couldn't help but chuckle at a conversation between our seven and eight year old children yesterday. Although the reality isn't at all funny, the context of their little minds demanded a smile. Luke, our eight year old, was explaining to Sarah, our seven year old, that Satan had minions. Then, he added almost as an after thought, but they aren't yellow. You could see Sarah's seven year old mind spinning....Then, she asked, "Are they purple?" 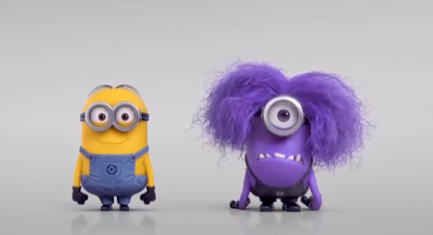 These are the minions from the movie Despicable Me 2. The yellow ones are friendly. The purple ones, um...not so much. However funny this little conversation seemed to me, it doesn't minimize the severity of the reality that Satan does indeed have minions and they are neither yellow nor purple. They are cruel, evil, oppressive. and destructive. "Put on the whole armor of God, that you may be able to stand against the wiles of the devil. For we do not wrestle with flesh and blood, but against principalities, against powers, against the rulers of the darkness or this age, spiritual hosts of wickedness (minions) in the heavenly places." Ephesians 6:11-12 (parentheses added). I, for one, don't like to talk about demons or the enemy too much. I think he likes the attention. However, it would be unwise to ignore that they do exist or that they do scheme to wreck havoc on our lives. These minions are constantly at work lying to us to get us to do their bidding or remain trapped in a cell of deception. However, we are not helpless. We are fully equipped with the Word of God to stand against "the wiles" or strategies of the devil. The trouble is many of us don't know the Word of God well enough to stand. We get attacked by the enemy and we just take it and get knocked down. God never meant for us to just take the punches. He has given us spiritual weapons to stand strong in battle. A stronghold is any lie or belief that you have that is contrary to the Word of God. Or a stronghold could be anything that you have come to rely on other than God. The enemy will lie and try to convince you that you must have ______ in order to be full. Jesus is the only One who can fill the holes and make us whole. Anything else is a counterfeit and when we come to rely on it, it becomes a stronghold. My friends, don't be naive. The enemy does indeed have his "minions" out to try to get us in strongholds and sin. We need to stay in God's Word and buckle down double when we see any traces of yellow or purple fog around our minds. Just kidding about the yellow or purple. I wish they were colorful so we could recognize them easier. When you start to feel anything other than joy, love, peace, patience, kindness, goodness, gentleness, faithfulness, and self-control, you can bet there is a purple perpetrator somewhere around. Friends, we can be aware even without the color notification. Are you in a stronghold today? Have you been relying on something other than Jesus to fill you? The good news is when we can recognize what is going on, we can do something about it. We can see what God says about it in His Word. Bring every negative thought captive to the obedience of the truth of Jesus. Stand. Win. We don't need to let any minions get the better of us, no matter what color they come in.